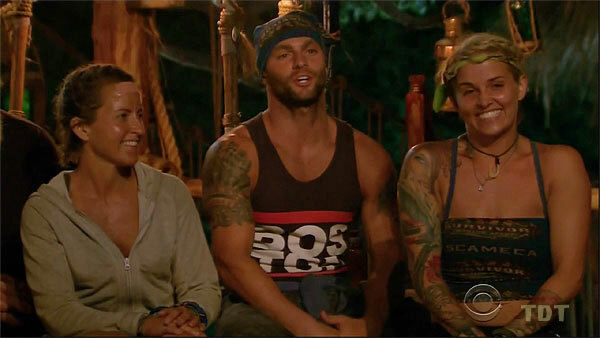 Survivor: Worlds Apart (2015) - 4th place, 15th out - 8th juror. 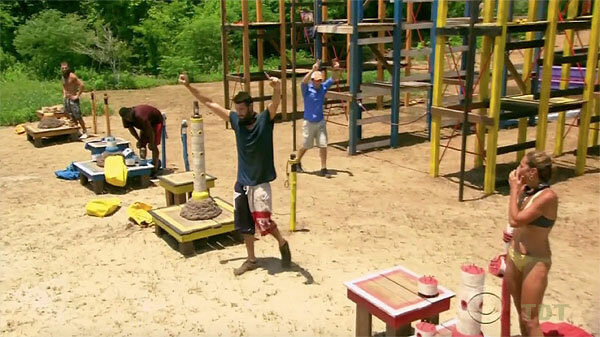 Voted out in Episode 14, "It's A Fickle, Fickle Game" (Day 38). Worlds Apart Ep. 2 RC/IC: "Basket Case" - Final swimmer, feeds buoys to Sierra as Escameca doesn't lose again (2nd*/3). Worlds Apart Ep. 3 RC/IC: "Dear Liza" - Helps carry and pour the bucket, and Escameca wins (1st/3). Worlds Apart Ep. 4 RC: "Collar Blind" - Sits out, and eventually, Blue Collar loses (3rd/3). Worlds Apart Ep. 4 IC: "Houses of the Holey" - Swaps in, but can't place the last ball; Blue Collar loses (3rd/3). Worlds Apart Ep. 5 RC: "Beach Balls" - Now with New Escameca, launches a ball for a catch; Escameca wins (5-2). Worlds Apart Ep. 5 IC: "Swing Break" - Paired with Joe pulling the sled; Escameca wins big again. Worlds Apart Ep. 6 RC: "Air Raid" - Hits one target for Escameca, but they lose, barely (6-5). Worlds Apart Ep. 6 IC: "Shut Your Trap" - Throws his matchup vs. Carolyn, and eventually, Escameca loses. Worlds Apart Ep. 9 RC: "O-Black Water"- Part of the losing team, with Will, Jenn, Carolyn & Joe. Worlds Apart Ep. 11 RC: "Barrel Bridge" - Part of the losing team, with Mike, Sierra, and Shirin. Worlds Apart Ep. 12 RC: "Dulcimer Stomp" - Part of the losing team, with Dan and Tyler. Worlds Apart Ep. 13 RC: "For-Word Progress" - Part of the losing team, with Sierra and Dan. Worlds Apart, Ep.7 IC: "Get A Grip" - Eighth to drop out, circa 25 minutes (5th/12). Worlds Apart Ep.8 IC: "Hip to be Square" - Second-to-last to reach the final puzzle, does not win (10th/11). Worlds Apart Ep. 9 IC: "Keep on your Toes" - Fourth person to drop out (7th/10). Worlds Apart Ep. 10 IC: "Soul to Squeeze" - Places two out of six balls (tie-3rd/9). Worlds Apart Ep. 11 IC: "Water Weight" - Fourth man to drop out, losing to Mike (2nd/5). Worlds Apart Ep. 12 IC: "Back Splash" - Fourth person to drop out (4th/7). Worlds Apart Ep. 13 IC: "Puppet Master" - Still trying to snag his last bag when Mike wins (tie-5th/6). Worlds Apart Ep. 14 RC: "The Home Stretch" - As dad watches, still moving tiles when Mike wins (tie-3rd/5). Worlds Apart Ep. 14 F5 IC: "Going Blind" - Collects two necklaces (tie-2nd/5). Worlds Apart Ep. 14 F4 IC: "Final Four-Titude" - third to the puzzle, but makes zero progress (4th/4). Worlds Apart, Ep. 9: Joe Anglim (voted out, 5-4-1). Worlds Apart, Ep. 11: Shirin Oskooi (voted out, 4-2-2). Worlds Apart, Ep. 14: Sierra Thomas (voted out, 4-1). Worlds Apart, Ep. 4: Two votes, from Lindsey and Sierra. Worlds Apart, Ep. 14 (Final 5 vote): One vote, from Sierra. Worlds Apart, Ep. 14 (Final 4 vote): Two votes, from Mike and Carolyn (eliminated when he eventually loses the fire-making tiebreaker). Worlds Apart, Ep. 14: Voted for Will Sims (who finished tied for second, 6-1-1). Opening sequence confessional: I'm filet mignon, and they're a bunch of Steak-umms. It's so obvious. We would be stupid not to. Great. Jenn played an idol. Fine. Dan doesn't want to give up his spot for me. Mike has to lose soon, right? Great, Mike has an idol now? It's my birthday. Where's my cake? That's fine if nobody wants to swap out. I'll have another birthday. Hey Sierra. Did you know it was my birthday 3 days ago? Happy to see Rodney Sr.
Ha, Carolyn thinks she's final three! Guaranteed to get the million now! Finally! A damn birthday cake! 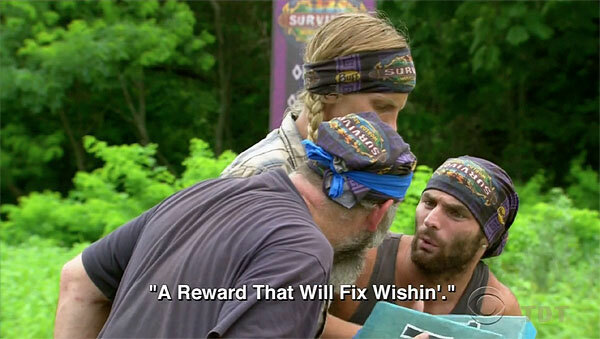 Gordon Holmes at XfinityTV - "Rodney - 'If You Come After Me, Bring a Hammer'"
Gordon Holmes at XfinityTV.com: "Survivor Castaways Sierra and Rodney on Why They Didn't Vote for Mike"
Rob Cesternino at RHAP: "Worlds Apart Winner and Final Five Exit Interviews"
Dalton Ross at EW.com: "Rodney STILL insists he would have won Worlds Apart"
Josh Wigler at Parade.com: "Rodney Lavoie Opens Up About Getting Fired from Survivor"
Steve Helling at People.com: "The Survivor: Worlds Apart Runners-Up Tell All: 'We Were So Close!'" Daniel Fienberg at HitFix.com: "Rodney Lavoie Jr. and Sierra Dawn Thomas Talk Survivor: Worlds Apart"
"Personal Claim to Fame: I was captain of the Boston high school all-star football team and the basketball team. Also, I graduated with a bachelor’s degree. Why Will You Be the Sole Survivor: With my smarts, athletic ability, hustle like a salesman and personality, I think I can make it, baby!"